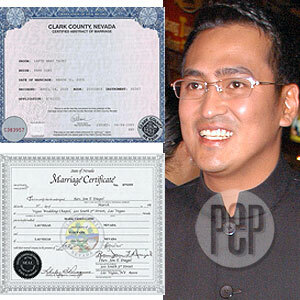 Mark Lapid is a \"married man\" and \"a father\"
Mark Lapid is a "married man" and "a father"
PEP (Philippine Entertainment Portal) has a copy of a marriage certificate (inset) which states that Mark Tadeo Lapid married Yuri Park on March 31, 2005, at Clark County, Nevada, Las Vegas. Mark Lapid is running for re-election as governor of Pampanga in the May 14 elections. The second son of Senator Manuel "Lito" Lapid, Mark first became known to the public in 1999 as an actor, when he played a small role in Largado, Ibabalik Kita sa Pinanggalingan Mo, a film topbilled by his father. In 2004, he became more famous when his name was linked to Kris Aquino, the famous TV host-actress. That was also the year Mark ran for governor of Pampanga and was elected. An email, received by PEP (Philippine Entertainment Portal) on May 7, 2007, would cite more reasons why 2004 was a memorable year for the 27-year-old action star. The email came from a certain "Maria Lapid." She identified herself as a friend of Mark Lapid's "legal wife." In Maria's own words: "Mark T. Lapid is married man and a father of one year and eight months old baby girl." Maria Lapid claimed that Mark's wife is Yuri Park, a 30-year-old Korean citizen. Maria said Yuri met the action star-politician in 2004. As with all claims regarding movie stars, PEP was careful to investigate. This became doubly imperative at this time when the star involved is running for public office and the possibility existed that "Maria Lapid" may have been created by the star's political enemies. Moreover, "Maria Lapid's" claim that her romance with Mark Lapid began in the year 2004 was curious. This was the same year that Mark's courtship of Kris was known all over the country, having covered by the newspapers, radio and, definitely, by television, where Kris had a regular showbiz talk show. The Philippine Daily Inquirer, on March 30, 2004 , wrote that Mark was on the phone confessing that he was wooing Kris: "Paglolon ke pu talaga, Ma'am." This translates to: "I'm really courting her, Ma'am." However, theirs was a shortlived romance. By June 2004, Kris had broken up with Mark. PEP asked Maria to send documents to support her claims, and she sent us 23 attachments, including scanned images of a Marriage Certificate, Certified Abstract of Marriage, divorce papers, and photos of Mark with a baby she called Maria Casandra Park Lapid. The Marriage Certificate. The document bears the seal of the County of Clark in the State of Nevada. It states that Mark Lapid Tadeo married Park Yuri at the Vegas Wedding Chapel, 320 South 3rd St., Las Vegas, on March 31, 2005. Application number is D792555. Recording/issuance date is April 4, 2005. The Divorce Papers. This was filed on February12, 2007, a few days before Tanya Garcia, the politician's present girlfriend, announced that she was two months pregnant with Mark Lapid's child. • "That Plaintiff, MARK T. LAPID, is now, and for more than six weeks immediately preceding commencements of this action, has been an actual, bonafide and domiciliary of the county of Clark, State of Nevada, actually and physically residing therein during all of said period time, Plaintiff, has had and still has the intent to make the State of Nevada the home, residence and domicile for an indefinite period of time." • "That MARK T. LAPID and YURI PARK shall have joint legal custody and joint physical custody, care and control of the parties' minor child..."
• "Child will be staying with the mother two weeks after the divorce is granted, after which the child will stay with the father for the next two weeks. So each parent shall have physical custody of the child every two weeks once the divorce is granted." • "That MARK T. LAPID shall pay $200.00 in and for the support and maintenance of the parties' minor child..."
• "That neither party should pay espousal support in this matter." • "That Plaintiff [Mark Lapid] was born February 16, 1979, no driver's license and is unemployed at this time." • The Affidavit of Due Diligence, which is part of the divorce papers, and also filed by Mark Lapid at the District Court of Clark County, states: "Defendant [Yuri] no longer resides at the previous address. Affiant [Mark] checked with the post office for a forwarding address, contacted utilities, the Jails, defendant's last known employer, to no avail. Affiant was unable to obtain further information by talking to neighbor or friends of defendant." Maria's Claims. Maria Lapid's email to PEP said that Mark "lied" about not being able to contact Yuri. Maria added that it was in this meeting that Mark "asked her [Yuri] for a divorce." Maria said this came as shocking news to Yuri because the last time Yuri and Mark saw each other in "Hong Kong" on "October 28, 2006," "they had a really happy time together celebrating the first birthday of the first baby Lapid." Furthermore, Maria narrated, "He [Mark] told her [Yuri] that bad things have happened to him ever since baby Maria was born. As the wife and mother of the baby he was referring to, she couldn't believe her husband, Mark T. Lapid, could say that about their baby." Maria also said that Mark "had to state" that he could not reach Yuri "to fast track the [divorce] proceedings." Maria also noted that for Mark to file divorce papers in the state of Nevada, he needed "six weeks residency requirement." Mark was not in Nevada for the minimum six weeks continuous residency, she argued. "There was no way for Mark Lapid to reside in Las Vegas because of the coming [Philippine] election." Yuri Park's official statement. PEP sent another email to Maria Lapid saying that we needed to get Park Yuri's official statement. Maria replied with: "ok. I'll forward you mail to miss Yuri." 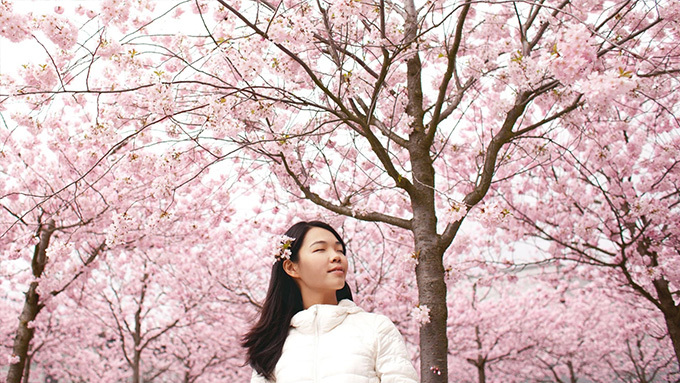 At 11:53 p.m. of May 7, 2007, PEP received a signed email from "Yuri Park": "Hello. I'm Yuri Park, regal [spelling hers] wife of Mark T. Lapid. I have a critical condition since I've known what Mark did to me and baby Maria. Yuri's email went on: "Mark blamed all the bad things happend ever since his daughter Maria was born. Have you seen a father who said like this about his own child? I got shock and I live with much pain now. "He suddenly asked me to divorce without any explanations. And even he lied to US court to file divorce by himself. I hope you understand me that I have to decide to make people know about him. He is dishonest and immoral man." Mark and Tanya. On May 7, PEP contributor Rose Garcia did contact Mark Lapid through Tanya Garcia, who, at that time, was on her way to the Asian Hospital for her baby's congenital scan. Mark was supposed to follow and accompany her, but he had to return to Pampanga to campaign. Tanya told Rose Garcia that she may go to Pampanga to be with Mark on Wednesday, May 9, and that she would tell Mark about PEP's request for an interview. This morning, at around 11:30 a.m., Rose phoned Tanya to ask about Tanya's own reaction to this issue. Tanya's reply was: "Natatawa ako...Actually alam ko na 'yan. Basta for now, no comment muna." Tanya Garcia also said that Governor Mark Lapid will comment on this issue after the May 14 elections. It is PEP's understanding that this is the advice the governor has received from his counsel.